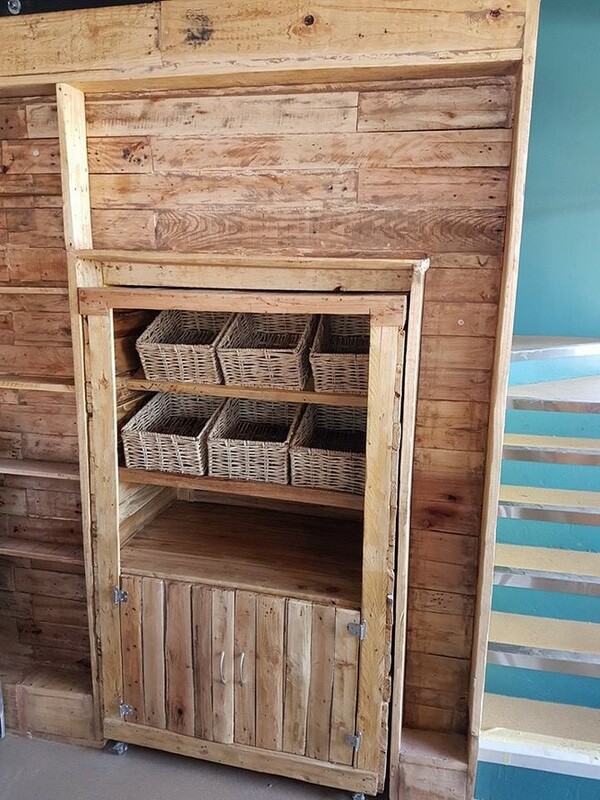 This matter has been discussed so many times on this platform that this is the positive aspect of the shipping wood pallets and the versatility that they can be used even in numerous commercial projects. Because this is not about the timber but this is all about your creativity and skills that how you shape certain wooden furniture item. For instance if you are making a wooden pallet couch, you can shape it in a certain way that it becomes quite suitable for commercial places. To demonstrate all this, we are going to bring you guys pallet works in the restaurants. 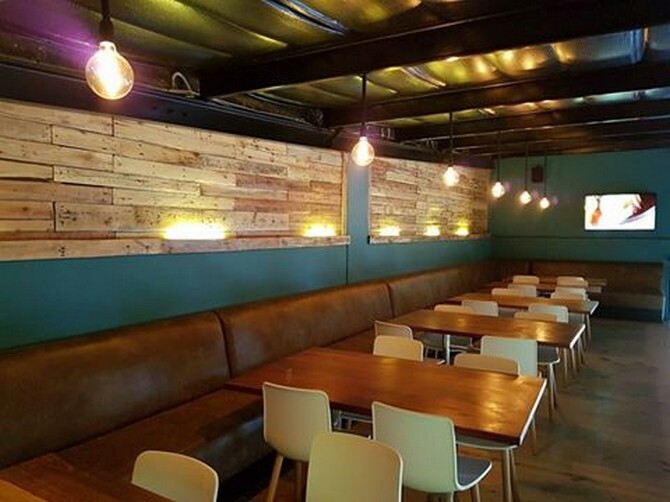 First of all look at this exquisite wooden pallet wall cladding that we have done with all care to present you guys and the visitors an intoxicating atmosphere. With a touch of lighting additions we have turned the place into a heaven. 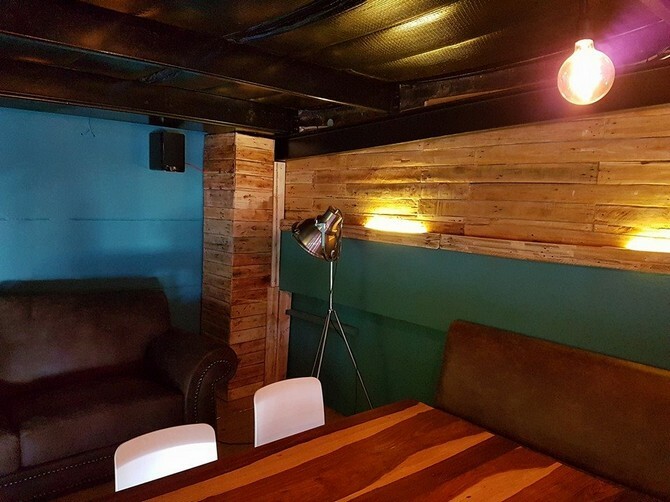 Just enjoy this thrilling and intoxicating atmosphere all set with the wood pallet planks. Now come to some bathroom installations. 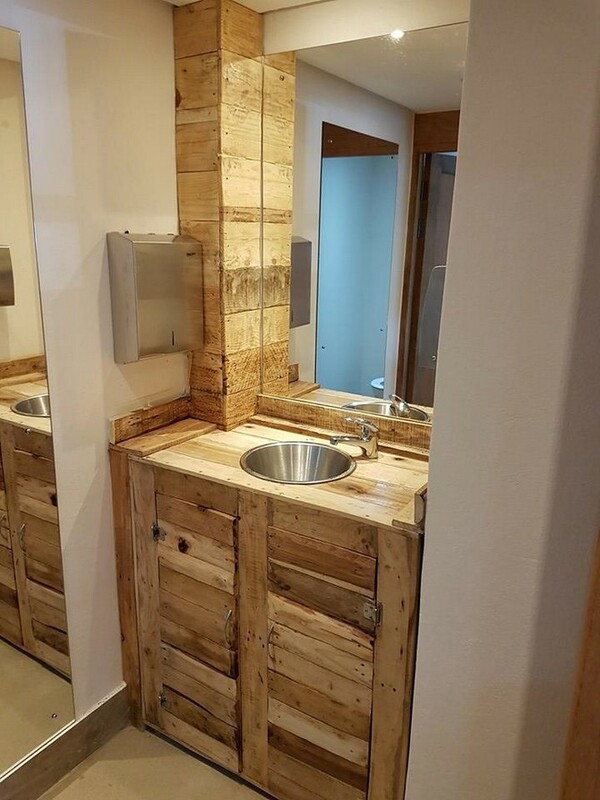 The entire bathroom sink is made with the wood pallet where a generic metallic tap along with a metallic basin is installed making it a perfect hand washing area. 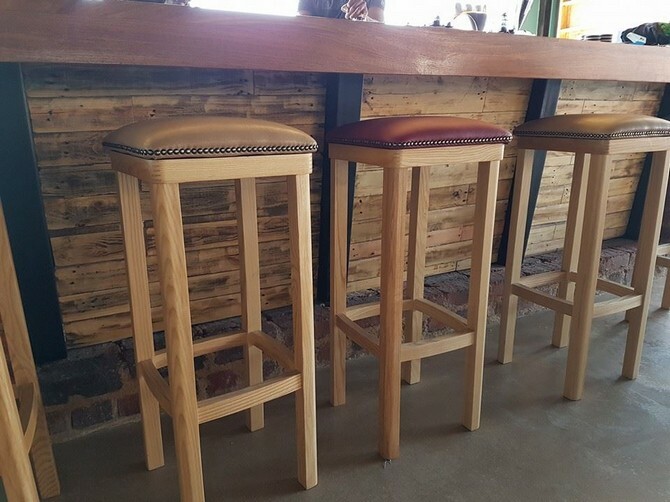 Don’t worry about the wood, it can tolerate the water for very longer periods of time. 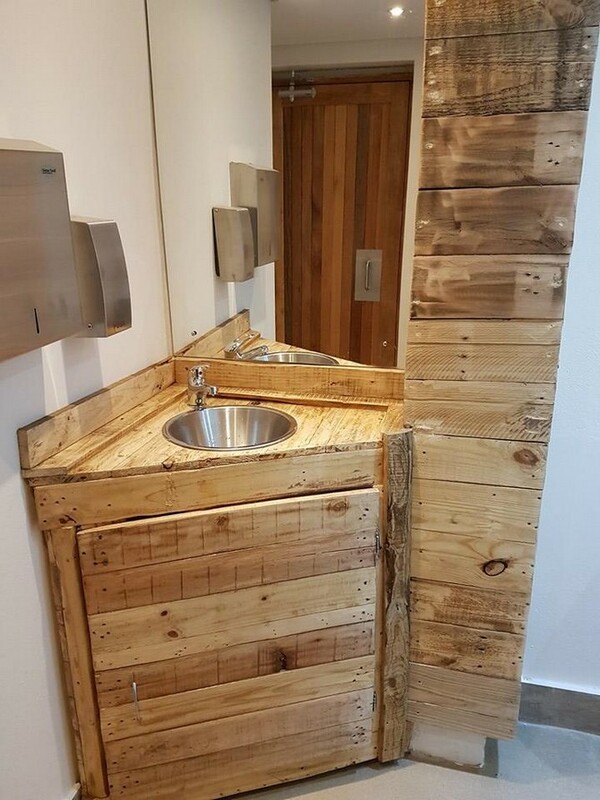 This is another part of the bathroom where another hand washing sink is installed inside the wooden pallet recycled cabinet. It has got some large compartments that can all be used to stuff inside some bathroom accessories like hand washing soap, towels etc. Here is a decent pallet wood bar table that we have already recycled a number of times. No doubt it takes a lot of timber as wood pallet and also a bit excessive hard work, but ultimately all the work is just worth it. There must not be any doubt regarding the versatility of the shipping pallets, they can be used just anywhere, depending on your innovative skills and creativity. As this is pretty unique sort of wall cladding along with a wall shelf all done with the same wood pallet planks. Some mixed kind of shipping pallets are used in the execution of the whole project. 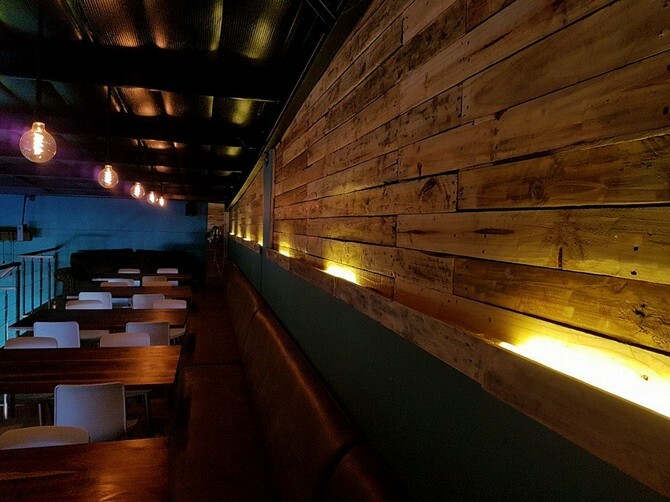 Now have an internal look of the restaurant, we can see the wood pallet work all around the premises. Some wooden furniture items are made with the wood pallet again. 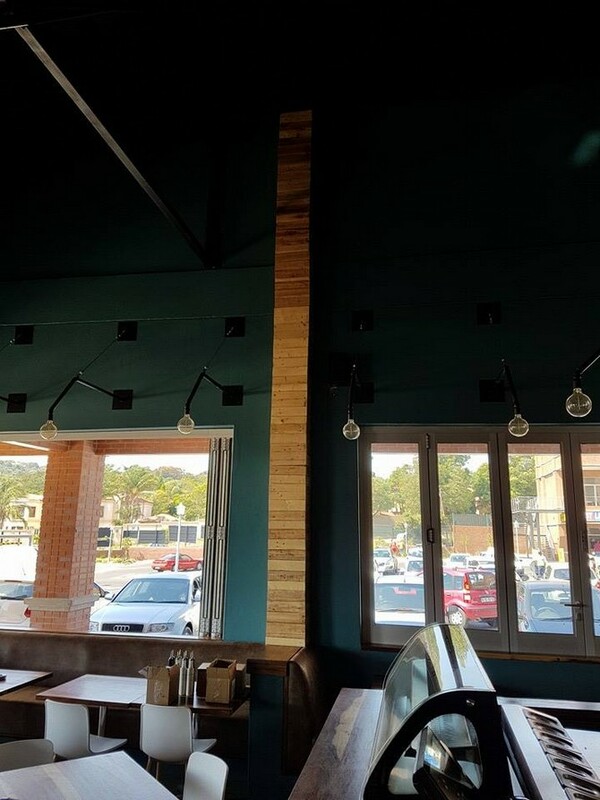 Plus the wall cladding in the entire restaurant is most prominent.